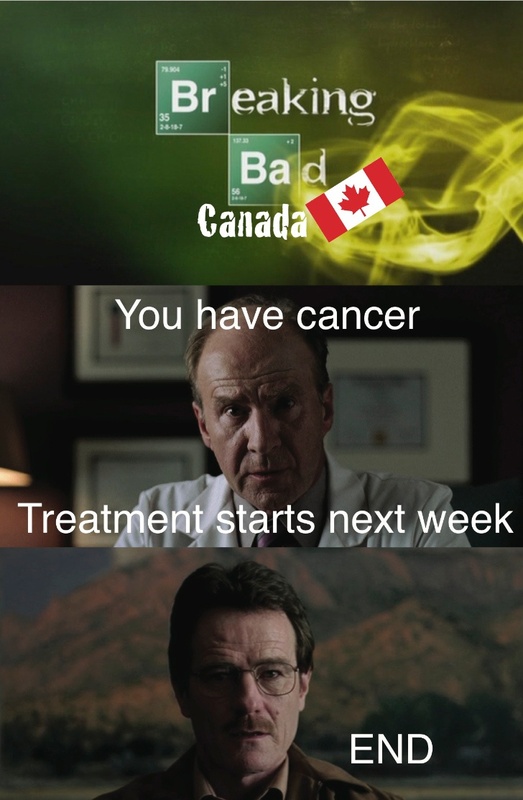 This is why "Breaking Bad" would never happen in Canada. The comic was created by Christopher Keelty, a writer and occasional cartoonist who lives in New York City. The inspiration, according to Keelty, came when he started watching the AMC series with his girlfriend on Netflix. With the series in its final season, he figured it was about time. "From the first episode, I was struck by the way the show (rather brilliantly) juxtaposes two of America’s most catastrophic policy failures: The for-profit health care industry and the failed War on Drugs, which has created a black market that makes the manufacture and sale of illegal drugs incredibly profitable," Keelty said in an email. "I got to thinking how uniquely American the show is, and that led to the comic strip." He wasn't the first to realize how uniquely American the show is. This image went viral earlier this year. The show got Keelty thinking so much that he wrote some blog posts, including one on his own experiences with the American health care system. Keelty and his girlfriend have become completely addicted to the show and now hope to be caught up in time for the finale this Sunday.